Printable Black & White PDF Printable Color PDF More Paper Dolls & ClothesYears ago, I was asked if I had ever explored minimalism fashion for my paper dolls. Minimalism? I thought. I love layers and ruffles and over the top gowns, why on Earth would I want to explore minimalism. But even as I thought this, I realized that was the reason to explore it. Because it is not what I am naturally drawn too. And because it is a style where one badly drawn line out of place can make a huge difference in how the finished paper doll dress looks. There is no hiding in details in minimalist styles. They are so simple that they reveal all my messy linework and misshapen pieces. So, when I come back to fashion minimalism, as I do on occasion (and I am today), I am reminding how critical every line is in pen and ink based art. Every line matters when there are very few of them. 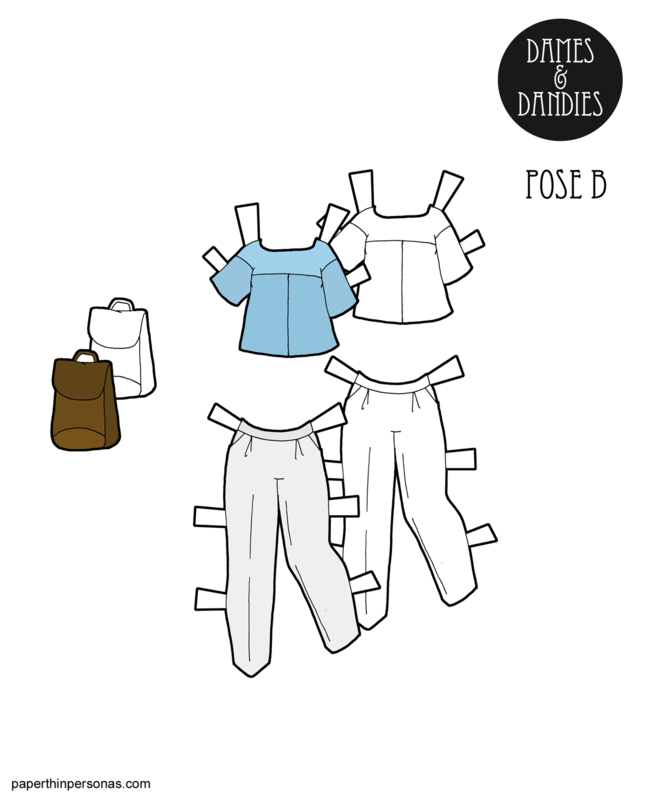 While there’s a simplicity to today’s paper doll clothing, there is also a challenge to drawing it. Sometimes the simplest things are the most difficult to illustrate. Today’s top, pants and bag were harder than they look and that, I suppose, is the whole point. Besides, as hard as they were to draw, they were so simple to color. There’s something to be said for that as well. I went with white and blue, because I didn’t want to obscure the line work by going with black (the favored color of many minimalist designs).